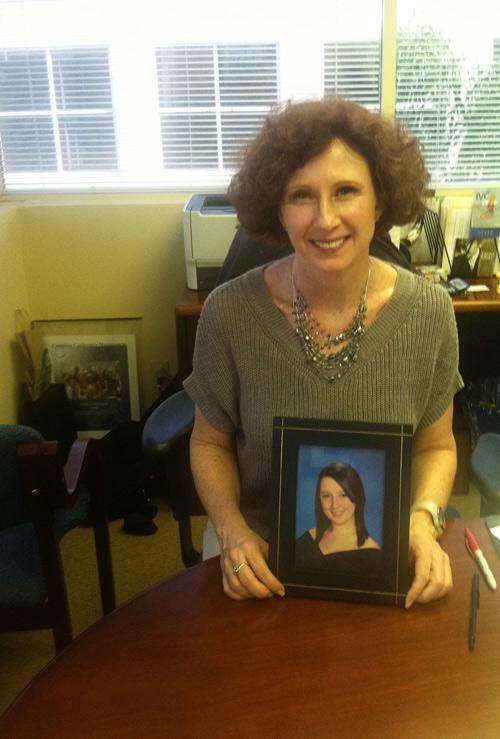 Susan Holtzman with a photo of her daughter, Elise. For Susan Holtzman, the really terrifying parts of Hurricane Andrew didn’t begin until the day after the storm. Susan was nine months pregnant at Baptist Hospital in Kendall. It was the day before she was due to give birth. …the railroad yard scene in Gone with the Wind where there were just wounded lying everywhere. I mean there were just people everywhere that were hurt. And there’s a few I remember: there’s a man that had weathered the storm on a boat in a marina and had debris embedded in his back because he had been exposed to the wind. Holtzman had two reasons to be at Baptist that day. One, pregnant women in their third trimesters, like Holtzman, had been asked to evacuate to hospitals. And two, she worked at the hospital. It was an administrative position; she didn’t normally deal with patients. But in the days after, it was all hands on deck. The first day after the storm, Susan was assigned to help a doctor fill out charts—even though she didn’t have any experience doing that. Holtzman went home to check the damage; her roof had blown off. While her husband, Lou, attended to that, she went back to the hospital and went to work. My husband was very concerned, he wanted me to call my doctor and I kept telling him you know, ‘I’m fine, the baby is fine, all these other people aren’t fine, so let’s just focus on that’ which you know, thinking back maybe that wasn’t the best thing. On her due date, Holtzman was at the hospital, answering one of the few working phones. It suddenly occurred to her that she hadn’t felt her baby kick. And so I just thought, “Okay don’t panic, you’re in the right place.” I just felt like I was walking very slowly, one foot in front of the other. When Holtzman arrived at the labor and delivery ward, she got a nurse’s attention. The nurse showed her a monitor of the baby’s heart beat. Everything’s okay she said. Then, they watched the baby’s heart rate drop to zero. There was a lot of yelling…sort of orders being shouted: “Get her clothes off.” And they told me, “We’re gonna break your water here.” You have to insert a sharp instrument and the amniotic fluid gushes out and that’s not really something you would normally do in a hallway. The baby’s heartbeat came back. Under normal circumstances, Holtzman’s doctor said she would have had a cesarean after that. But it wasn’t sterile. So the doctor induced labor. He said it would be a while, and he left to check on things at his house. By then, her husband Lou had arrived. They still didn’t know why the baby’s heart had stopped, just that it had. Susan was trying not to think about the possibilities. A few hours into the waiting, a nurse checked on Holtzman. Holtzman had gotten an epidural, so she didn’t realize that the baby was coming. At that point, many of the nurses and doctors had been on call for days—some of them didn’t have homes to go back to. The halls were filled with the wounded. The rooms were sweltering because the air conditioning was still out. The water wasn’t to be trusted. And yet, for Susan and Lou, the hospital just sort of disappeared. That tough little girl is now an accomplished young woman. Elise Holtzman just finished an internship with Congresswoman Debbie Wasserman Shultz. She’s about to start her sophomore year at the University of Maryland, double majoring in American History and Government and politics. Elise says as a kid it didn’t really sink in what a big deal the hurricane was for her parents. I think that when I have a child I will be freaking out in perfect conditions and it just shows me that they are such strong people, both of them. On August 26th, Elise Holtzman turns 20.